Motherhood Mondays: Mango & Peach Crumble + A Whole Lotta Awkward. So I was taking my son down to the park for a walk. This energetic kid comes over (he must be about 3 and a half; my son who is one and a half,) and starts playing with him. He’s a cute little feller, I have seen several times from my window, riding his tricycle and generally making merry and letting all that toddler energy out. Since she has come over, I thought it would be polite to start a conversation. Cute Feller’s Mom: Smiles weakly. Cute Feller’s Mom: Smiles vaguely; does not seem happy with the fact that I have seen her son riding his tricycle. She has this skeptical look; as if I am a baby-stalker. The boys are getting along fabulously and pulling each other in different directions. They show no signs of letting up. Cute Feller’s Mom: Smiles like she is stuck in an elevator with her nasty boss. Cute Feller’s mom pulls him away and I carry on. A week after this, I was twirling Raghav on the merry-go-round. She was heading to the playground while texting on the phone…she looked up, saw me and veered away with son in tow. Cute Feller’s mom clearly does not like me. Or like the fact that I noticed her son, or asked her what her name was, and which building she lived in, because that is a nuclear secret. That information is meant to be more classified than the whereabouts of defecting/disappeared Scientologists. I mean, considering that we live in the same apartment complex and will see each other at all the Diwali, Christmas, New Year’s, and Holi parties and every other social event in between, there was very little chance that I would have found out right? Did I break the rules of playground etiquette? 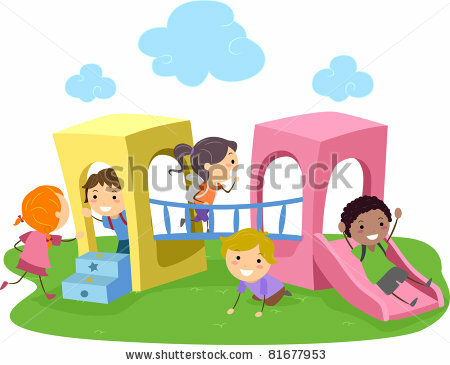 Are you not supposed to talk to other mothers in a playground? Because I know I am not malodorous and I always check if I have anything stuck between my teeth before I step out. And here is my Last-Minute Mango & Peach Crumble, which I literally threw together in a rush a few weeks ago because we had a surprise guest and I didn’t have the time or resources to bake a cake. There really aren’t any exact proportions you should follow; I made this with whatever I had and just went with my instinct. First, prepare your custard. 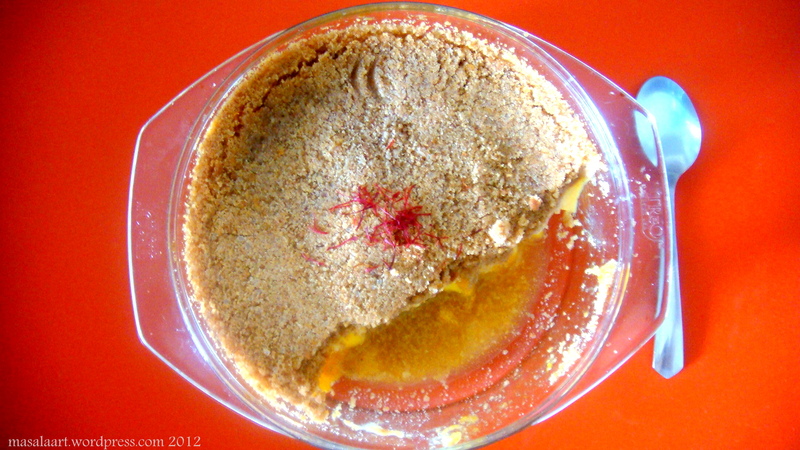 I used regular packaged custard powder; if you would like to prepare it from scratch, go right ahead! Once it is thickened, cover with cling film so that it doesn’t form a skin on top. Allow your custard to cool to room temperature. Next, crush the digestive biscuits and work in the cold butter with your fingers, till the mixture gets nice and crumbly. In a bowl, put the diced fruit, honey, lime juice, nuts and saffron and combine well. In a baking dish or deep serving bowl, place your juicy fruit at the bottom. Pour the custard over the top and chill for 15 mins in your fridge. Once chilled, spread the crumbled digestive biscuits over the top and gently pat down. Keep chilled before serving. It’s quick and yummy. If you are really rushed for time, you can easily substitute the custard with store-bought, ready-to-eat vanilla pudding. And of course, digestive biscuits can be replaced with graham crackers. Maybe I should eat more of this and get less touchy about moms who may not want to socialize on the playground. Disclaimer: This post is in jest, people. I do not, nor will I ever, own a windowless white van and stick it in the basement. I have no idea how to meet moms at playgrounds without freaking them out either. It seems there’s places you’re supposed to meet people and places you’re not. I don’t get it. Haha! I’m glad to know I am not alone in my playground encounters. I don’t see how you can socialize without introducing yourself! Well, anyone who doesn’t fall for Mimi’s smile and charm is clearly a robot! Yeah, I realize that some people may just want to have some quiet time, or are just shy- especially parents who may be working and commuting all day. I will respect that. Keep calm and carry on! Playground etiquette is still such a mystery to me. Honestly…I’ve given up trying to figure out some of these moms. Similar things have happened to me and I just try not to take it personally. Not easy, I know! I think that’s the best way to handle it. I have had people start conversations, then act weird when I introduce myself etc. Aaah, who cares. I have awesome blogosphere friends!! I think the best way to warm her up is to give her some of your stunning crumble – though maybe you should just eat it in front of the ice queen instead! Hahahahahaha!!! Perhaps the crumble will melt the ice. I like the sound of that. And I’m not just saying that. I mean it. What a weirdo. Maybe SHE has a white van. Maybe SHE kidnapped the cute friendly boy and is afraid you are suspicious. Because they are clearly not from the same gene pool. At any rate, I reeeeeeally think that when you see her enter the common areas – if you see her at all- you should grab Raghav and power walk very obviously in the other direction. So she knows how ridiculous she looks. OR! March up and be really nice and watch her squirm. OR! Point blank ask her why she runs away from you and your friendly adorable baby. See, I feel so much better when I listen to you guys. But having said that, I realize that some people may actually just be shy- and are not as outgoing. Have to respect that too! Don’t bother with her! There will be many perfectly sociable young moms around for you to interact with. Give her the cool shoulder and maybe she will warm up to you! Haha maybe she’s a part of some super secret playground clique and you’re not in on it yet! 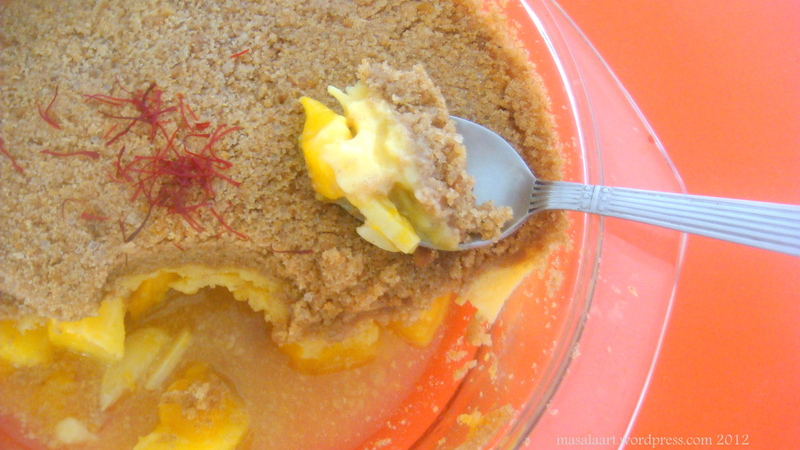 Maybe bribe her with some of this yummy mango and peace crumble and you’ll be in! Yeah…the secret clique with a secret code. I should cook my way in!! !